I got another ornament finished for Myrtle Beach and I got all the finishing done on them! I'm so happy to have them done and I hope whoever gets them will enjoy them! 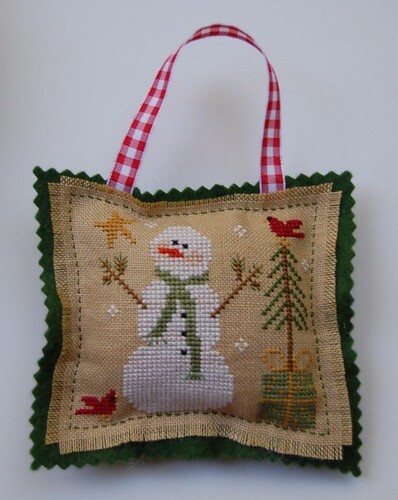 Little House Needleworks "Frosty Flakes"
They all look wonderful Nicole, congratulations! Awww these are SO cute!!! They are so cute!!!! Hope you have a fun trip this weekend :-). They are all just adorable and perfect Nicole! You did a great job on them! Have fun girl, you deserve to! I love the ornaments!!! Have a wonderful wonderful time, Nicole!! You deserve the break! All of the ornaments are adorable. I love the way your chose to finish them. Enjoy your stitching retreat at Myrtle Beach. Beautiful Nicole! Have fun in Myrtle Beach! What lucky recipients they will be! Have a great time at the beach! I love how you finished them ... they look awesome! I love how you finished these ornies! I will probably copy your finishing. They are so cute! I love how you finished them! Have a fun trip to Myrtle Beach! Nicole, I love the way you've finished these ornaments !!! Have lots of fun on your trip !! Well, I know you, Karen and Faye are all going to be there! Don't forget to take plenty of pictures. Your ornies are adorable and will be well received! 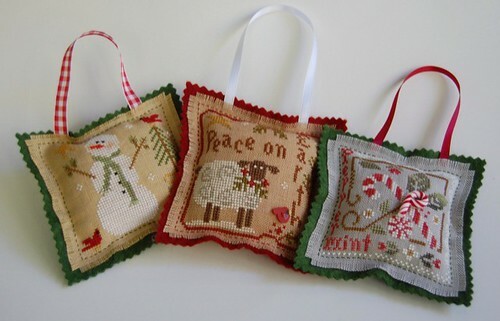 Those are all so cute....makes me want to go stitch an ornament!!!! They are so sweet! I love how you finished them. Great idea! Have a fun time on your trip! The snowman is so cute!!! Love the way you've finished them. Very different. Those are wonderful ornaments! Someone is going to be thrilled with them! So cute, and beautifully finished - congrats! They are very cute. Enjoy your trip. What gorgeous ornaments, I especially love Winter Sheep, but they're all so cute. Your ornaments turned out so cute!! Have a blast at the stitching retreat!! Oh how I wish I could go to one someday!! !